We own two teddy bears, imaginatively named, or so we think, Edward and Teddy. Presented to one of us as Christmas gifts several decades ago, they have lived with us throughout our married life. Edward is the stay at home type. Introspective and somewhat uncommunicative, he presides over the dining room here in Budapest with an authoritative air. Although closely witnessing the comings and goings [as well as eavesdropping on the delicious gossip] of our friends and guests at the dining table, Edward can always be relied upon to be the soul of tact and discretion. Teddy, on the other hand, is a gregarious bear, accompanying us to the Opera, to restaurants, and to concerts with enormous enthusiasm. 'Tosca' is a favourite, so much drama, and on one particularly historic occasion he sat through all nine Beethoven symphonies without so much as a growl. Members of the audience often will wave to him in the Dress Circle from the Orchestra Stalls, whilst concert goers will frequently take his photograph. Teddy has yet, however, to give an autograph but it can only be a matter of time before his fame spreads sufficiently for a paw print to be requested. In one of our favourite restaurants, Klassz, on Budapest's grand boulevard, Andrássy ut, a place is always set for Teddy when we arrive, a spoon considerately replacing the tricky to manoeuvre knife and fork. And as we survey the room of diners who seem to be so much more involved with texting, tweeting or emailing on mobile telephones rather than, as once one might have expected, engaging in conversation with their companions so we think, perhaps misguidedly, that there is so much more fun to be had with Teddy. All of this serves to remind us of 'Cynthia'. Full of bosom, small of waist, a perfectly formed 100 pound mannequin who was not only glamorous but also as silent, so to speak, as the grave. In 1930s New York, Lester Gaba worked in the retail display business. 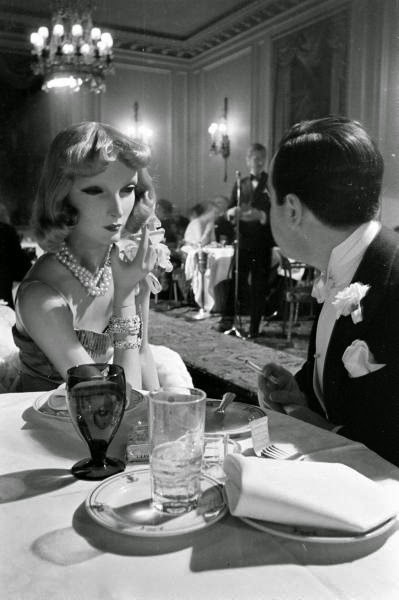 In the absence of suitable drinking and dining companions he created the exceedingly lifelike 'Cynthia' in honour of the New York socialite Cynthia Wells. 'Cynthia' was seen everywhere on the arm of the fashionable Gaba, but never heard. Gaba insisted that laryngitis was the reason why 'Cynthia' remained silent. 'Cynthia' had a credit card from Saks of Fifth Avenue, a box seat subscription from The Met, her own newspaper column and radio show [Gaba said what 'Cynthia' thought] and she even made it to the cover of 'Life' magazine. It was a sad day indeed that she slipped from a chair in a beauty salon and shattered into pieces. Thankfully her mould ensured that she could, and did, 'live'again. With the demise in real terms of 'Life' magazine in March 2000, our hopes for worldwide coverage for Teddy have, inevitably, suffered a setback. Possibly someone from Condé Nast, perhaps the Editor of 'Tatler', may be reading this? N.B. We have been unable to source the photographer(s) of the images posted here of 'Cynthia'. We should be pleased to include acknowledgements. We are absolutely certain, Launna, that you and Teddy would be the very best of friends! We do become, as you so rightly say, rather concerned at the way in which as a society we seemingly have become dependant on mobile telephones to the extent that so often we fail to communicate in the real world. You certainly have a wonderful imagination. If only each of the bears could talk, they would have some tales to tell. Perhaps it is just as well that neither Edward nor Teddy can actually reveal what they see and hear. That said, they provide us with much in the way of amusement. Hello Hattatts! Of course what first comes to mind is Aloysius! And how in the world did you know about Cynthia? Of course much is owed, Carol, to the pen of Evelyn Waugh!! As for 'Cynthia', such a find!! If only we had been in New York at the time!! How very splendid to have Yorkshire Catholics, Bernice, as one's ancestors. Can one get better than that? We have always felt that 'Brideshead Revisited' to be one of the best of Evelyn Waugh's novels and was, in our view, well adapted for television in the original version with Jeremy Irons and Anthony Andrews. What a delightful introduction! We here in Chicago long for the day when we can give a conquering hero's welcome to Darlings Jane & Lance and also The Adorables: Edward & Teddy. We'll arrange so that whether we all find ourselves at Orchestra Hall, the Civic Opera House, or nipping into The Red Lion for a nibble and whistle whetting that your expectations will be far exceeded, your whims will be catered to, and your souls will be uplifted and enriched. Only your departure shall give us a moment of sadness until we can plan our next adventure together. Such tremendous fun all of this will be!! Our only concern is that, aware as we are [and who is not? ], of the devastating efficiency and no nonsense approach of the United States Customs and Immigration, the tummies of Edward and Teddy might be ripped open in the search for narcotics or some such and that we shall, as a result, be left with monstrous medical bills which will then, on examination of the small print, not be covered by our insurance. Oh woe is us!! But let us dwell on the positive, and that is the joy of propping up the bar of The Red Lion, with or without bears in toe, in the company of your own self and all of the interesting and lively people with whom, without a shadow of doubt, you surround yourself. Now that, darling G, is certainly worth crossing the Atlantic for. Correction: for 'toe' read 'tow'!! Emily has left for college and this has brought fond memories of her "Teddy". She went everywhere with him until he decided to stay at the zoo one day. But how very, very sad for both you and Emily. We do hope that her 'Teddy' has found comfortable lodgings at the zoo. My heart goes out to dear Edward; such a sweet boy. I think Teddy has been taking notes from Cynthia! What fun! What a wonderful thought, Patricia, that Teddy and 'Cynthia' should be in cahoots together. We love the idea. Oh to be a Gaba Girl and to be sent diamonds and invites to Royal weddings! I'm sure I could keep my mouth shut for that sort of treatment... although I wouldn't fancy being shut in a cupboard. P.S I also have a couple of bears. Absolutely. We are just slightly envious of 'Cynthia' having received an invitation to the wedding of Edward VIII with Mrs. Wallis Simpson and not a little sad that Teddy was overlooked at the last and most recent Royal wedding. Are the Middletons to blame?!! But how splendid that you have two bears of your own. Yes, Curtise, Edward is something of a dark horse [if that is not to confuse metaphors] and, most certainly, in his younger days he did enjoy a wilder lifestyle than of now and is, probably, better travelled than Teddy. Now,as for 'Cynthia', she most definitely was a legend in her own lifetime and what fun it would have been to have met with her and Lester Gaba. How nice it is to see you back on my reading roll. I have been wondering about the adventures you two of you have been having. Little did I know that there were three of you! I am sure that Teddy hears more than a bear would normally hear due to his very quiet, contained and - dare I say - trustworthy appearance? If a bear could be a Father Confessor, I think he would have Teddy's face. How really kind of you. This summer [where has it gone?] really does seem to have been taken up with all manner of things [all very happy] that there seems to have been too little time left over for the Blogosphere. A little respite now before the arrival of friends to stay later in September when, joy of joys, the new season of opera, ballet and music will have restarted. Now, a bear as a Father Confessor - that is a thought! ……..thankfully Edward and Teddy will not shatter into many pieces if they were to slip off the dining room chair, or the Dress Circle seat in that beautiful State Opera House (we looked inside when in Budapest). I so lovely 'teddy bears' and am actually now humming "The Teddy Bears' Picnic" to myself! We are in New Hampshire on a stunningly clear and sunny late Summer's day. Sadly, the afternoon will bring a funeral for my dear mother-in-law being laid to rest after 96 amazing years - she was so kind to me when I first lived up here as a new bride in Bob's home town, far from England and my own mum. Will spend a few days along the Maine coast and the mountains of Vermont before returning south. Lovely to see your post and great photos. We certainly hope that you will wish to meet Edward and Teddy in April of next year, Mary. They, as we, are so much looking forward to your visit. Nearer the time we must see what is on at the State Opera House for when you are here. Whatever, there will be so much to see, do and talk about. We are so very saddened to learn of the death of your mother-in-law. Please do say to Bob how very sorry we are for you both. We can so well imagine how her love and warmth must have been a great support to you in the early years of your marriage so far from your own family. But you will not, we know, forget her. We do so agree, Jim, that there is much to be said for living with, as you put it, benign, inanimate creatures. They are certainly much easier to look after. And in your case, we cannot imagine otherwise but that your various lucky totems will stand you in good stead and that you are, in any event, watched over by the most gentle and kind of all spirits. Of that we are certain. Funny I just checked your blog this am to see if I had missed a post. How wonderful that your two teddies are so unique and that you have had them all this time. Nice to have one to travel with you to engagements to keep the two of you company and one to hold down the fort at home. As far as Cynthia goes, what a great idea, so creative of Gaba, seen and not heard to so to speak. Ha. I really used to enjoy life and used to cut many photos out and made a wall collage when i was in high school. My parents eventually sold the home and I can remember a woman came to look at the house and my mom said I'll have the photos taken down and she said no leave them they are wonderful. I don't remember if she bought the home or not. Your teddies definitely belong on the cover, perhaps Time magazine for their longevity? We very much like the idea of Edward being seen as holding the fort at home. That is something which we are sure will appeal to him, Linda, as much as it does to us. The idea, and then execution into reality, so to speak, of 'Cynthia' we really consider to have been the most brilliant and imaginative of ideas and what a splendid man Lester Gaba must have been and, as you say, so extraordinarily creative. That you made a wall collage in your bedroom whilst at school we think to have been utterly amazing and wonderful. But then you too are a highly talented person in your own right. 'Time' magazine - that IS a thought!! How wonderful. Those two bears have so much personality. My son has a mouse called Cheddar who has accompanied us on various escapades and always has a place in the suitcase when we travel abroad. He has visited a variety of famous landmarks. Sadly, at eight, my son has started to prefer to leave Cheddar behind in the hotel room :( I had never heard the story of Cynthia. It's quite intriguing. We very much like the sound of Cheddar, Loree, who sounds to be exceedingly well travelled. It is indeed a little sad to learn that, for the time being, Cheddar is denied the sights when abroad. Perhaps you can suggest to your son that the hotel room could become a little tedious all day and all night and Cheddar might benefit from some fresh air!! As for 'Cynthia',so very amazing. My brother had a bear called Teddy Edward! Cynthia was such a beauty. What, we wonder, became of Teddy Edward?!! 'Cynthia' was, we feel, inspirational. Such an idea and so amazingly carried out. How do Teddy and Edward get along when they are both at home? Is Edward interested in Teddy's tales from the opera and restaurants? Does Teddy want to know any of the gossip Edward heard during one of the dinner parties? I wonder why I have not heard of Cynthia before. Her "life" must have been the inspiration for several books and films, I am sure. How very thoughtful of you, Meike, to enquire about the home life of Edward and Teddy. As they are both often to be found together in the dining room for long periods, we rather expect that they exchange news and views with each other. At least, we hope so!! 'Cynthia' was something quite extraordinary and really did become something of a celebrity during her 'lifetime'. Towards the end, Lester Gaba found her something of a trial. I wouldn't suggest Edward & Teddy invite any beagle pups over for tea. Such a sad tale you tell here of the demise of your own teddy bear. And if there is a moral to be had, then it must surely be not to place teddy bears and beagles together in the same room without supervision. What became of 'General'? A very military name to have chosen. Was he quite fierce? Alas, General had an ending out of a Thomas Hardy novel. Flash back to 1973 a high school boy in the neighborhood (I'll not name him here and subject him to vigilante justice) was speeding in his fancy 1972 Pontiac GTO and ran over General and realizing his misdeed doubled back and placed General's badly mangled body in the trunk, came and found me, and showed me General hanging on for dear life wrapped in beach towels and raced him over to the vet who had to put him down. I was devastated, as was my mum, and about a month later she came home with a new pup 'Bandit' who became the love of my life and who my children's book series is based on. Now Bandit was fierce and would face off against a Grizzly Bear if he so much as gave me a sideways glance. G, this is an appalling story. And now we feel so very badly for having enquired. Poor 'General', and poor you. Indeed, you describe this with such graphic detail that it now must be poor us! On a lighter note, we are delighted that all came good in the end with the replacement 'Bandit', although it has to be said that as a young boy you did seem to have a penchant for somewhat aggressive sounding names. A Thomas Hardy novel, yes, but we have no recollection of a 1972 Pontiac featuring in 'Tess' or 'Far from the Madding Crowd'!! Did we miss something?!!!! Darlings J & L please forgive me for darkening the mood on a day we are celebrating The Adorables: Edward & Teddy. The passage of time does remind one that even awful events can be endured and make us stronger and feel more grateful for the good fortune we do encounter. Now didn't one of the reddlemen drive a Pontiac GTO. (earlier model I believe) across Egdon Heath in Return of the Native or am I mistaken??? Nothing that you write could in any sense darken the mood of our day. Indeed, on the contrary, we absolutely delight in, and are greatly amused by [and this in the nicest possible way], all that you say and our lives would, we hasten to assure you, be much the poorer without the cutting edge [and often times rapier wit] which you add to the Blogosphere and which are to be found in your comments both here and abroad and, of course, on your home territory of 'The Lion's Den'. Where Hardy is concerned, we bow to your greater knowledge and/or acknowledge our fading memories. Fascinating story about Cynthia, although if she was 'created' more recently she would have been made in non shattering silicone. Edward and Teddy are a gorgeous pair, and elegant too to shrug away the look of having a mobile phone in tow. That is quite a thought - an unbreakable, indestructible 'Cynthia' who, with today's technology, could surely have been made to speak. We are delighted that you like Edward and Teddy although both are, rather sadly, showing their years. Hmm - I have a Teddy named Teddy, oddly enough, as well as an old steiff sawdust-filled fellow that has yet to be named. I thought of Edward, but copying can be poor form, so am thinking of calling him Budapest in your honour, Bud for short after my own dear dad! I am glad to think that there are teddy bears still roaming the earth; we could use many more. Their conversations are purposeful, loving and succinct. Bravo! How nice that you too have a Teddy. Alas, nether Edward nor Teddy is a descendant of the Steiff family - would that were the case - and so we are slightly in awe of your as yet unnamed member of that rather illustrious clan. And we are thrilled to think that you might choose the name Budapest which could be shortened to Buda for when he is good and to Pest when bad! Yes, the world at present could do with more harmless teddy bears. I love a good Teddy bear. I envy you your plush opera house. The one in Toronto has decent acoustics but lacks that old world charm and is not befitting your gorgeous bears. We are indeed most fortunate with the State Opera House here in Budapest for it is, in a traditional way, a most attractive building built to rival the one in Vienna. And teddy bears fit in beautifully!! You post has brought me great joy in being introduced to Edward and Teddy. Two noble characters. Teddy looks in great shape and is not any worse of the wear from sitting through Tosca and Beethoven. I can actually picture him taking an afternoon siesta. It must bring enormous joy to the audience when they catch Teddy's eye. Cynthia and Lester Gaba are a sight to behold and what a glamorous era it was then. You have brought to mind a great story of a client of mine who had a chicken purse. I will save it for when we meet. This is, as always, so very sweet of you. Your kindness, ever present, gives us great joy and is appreciated more than you can know. Certainly Teddy at the opera, or attending a concert, does arouse a certain curiosity. There are those who understand, and those who clearly think of us as completely mad. Perhaps somewhere between the two lies the truth!! Lester Gaba must, we feel, have been the most wonderfully inventive and creative person who inhabited a time where such eccentricity was much in evidence. Our own age seems rather dull in comparison, at least on occasion. Well, a bear with his own spoon is surely a worthy candidate for the pages of Tatler. Edward, now he has an identical twin. Rather less imaginatively monikered, 'Bear' sits on a window sill day and night and gazes out across a Devon garden. They are as alike in personality as in appearance, both seem to carry the weight of the world upon their shoulders. We, of course, love the idea of Edward having a twin and we very much warm to the name 'Bear'. As for gazing out all day onto what we know to be your very attractive and carefully planned garden, we can think of far, far worse ways to pass the time. It is a pity though that he cannot be encouraged to take up a hand fork from time to time! Ours, which dates from the early 1950s, still has something of a growl left when tipped backwards and forwards. Bear still has his 'growler' in so far as he rattles when turned upside down (as one might), but he utters not a sound. Here he is: http://www.rustyduck.net/2012/12/28/are-you-sure/ . Two peas in a pod. He is wonderful. And it is true, they really are twins!! Good job you rescued him. This is so very generous of you, Nicole. You most certainly must encourage your daughter to take a favourite bear or doll with her when she goes somewhere special. In that way the world does not lose its magic. We both hope that you too will have a really happy week, Take care. Oh, what fun, to be a bear belonging to Jane and Lance! I do recall a sawdust -filled one my mother owned, and my own bear as a child (which I still have, although he is a little worse (better?) for wear). My own daughter has one too, which she insists on taking everywhere we travel, which is fine and dandy if we go by car, but flights and their restrictions nowadays has limited her bear's travel. Thank you for introducing us to Cynthia and the delightfully eccentric Mr. Gaba. Oh, and fear not as I am sure Teddy will soon be known the world over, now that he has been rightly featured in today's blog. We are thrilled that you too still have your childhood bear and that your daughter is so attached to hers as to take it with her when you go away. Alas, security at airports, which we are sad that it should be necessary but grateful that it exists, does rather preclude taking anything out of the ordinary on one's travels and a bear does look a little suspicious especially when carried by adults!! 'Cynthia' was extraordinary, to say the least, and to have achieved such a reputation in a very short time was/is incredible. What a fun person Lester Gaba would have been to have around the dinner table [but possibly quite tricky too!!]. We've adapted to travel with a stuffed ferret as of late, as teddy looks a little shifty when traveling by air nowadays. The ferret is also so much more compact and portable, and is able to peek out of hand luggage and enjoy the trip. I think your comment on dining with Mr. Gaba may hold more than a little truth to it. I think all lovable eccentrics posses a "tricky" side to them, which makes them great company, for short bursts of time. Travelling with a stuffed ferret sounds to us to be great fun and we love the idea of his head peeking out of the hand luggage. Something for your fellow passengers to consider!! Yes, the eccentrics of life can be, and often are, great company but do have a tendency to be somewhat exhausting! Please bring both Edward and Teddy with you if you visit Bodrum. Of course! But we rather think that Edward has a fear of flying and would be very frightened in the dark of the hold! I have never come across Cynthia before, but Teddy must surely be a better more portable companion. John Betjeman used to travel with his teddybear, Archibald Ormsby-Gore, on the tube, and he even took him when he went up to Oxford. When people stared, he would exclaim, "Everyone's staring at you Archie. Behave!". 'Cynthia' was something quite extraordinary, Rosemary, and possibly could not have existed outside of 1930s America. Whatever, we shold love to have 'met' her!! 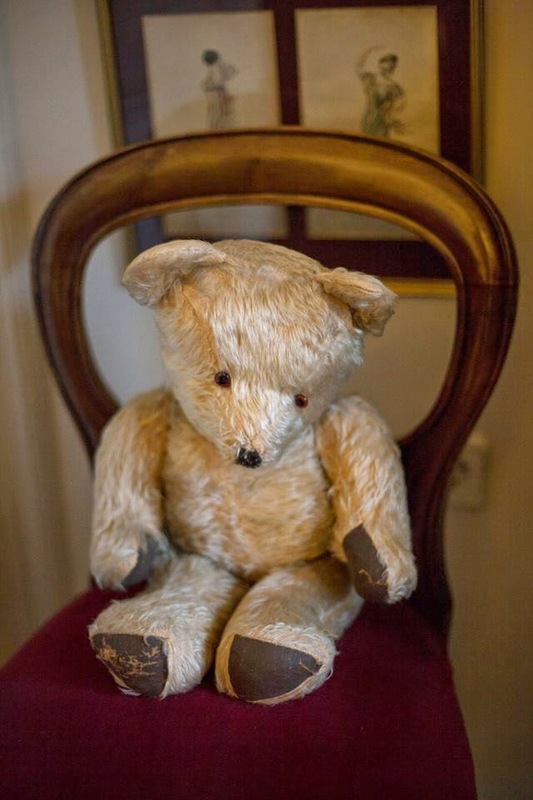 We had completely forgotten about Betjeman's bear which is quite strange since we greatly admire him as a person, a poet and as an essentially kind, or so we should like to think, and sensitive human being. In his lifetime he did so much to awaken public interest in so much architecture which, without him, might now be lost to us. We did not know that A O-G travelled on the tube. Such fun! Correction: read 'should' for 'shold'!! How very Interesting, I have never owned a teddy in my life time, as a fan of "Eyore" there is very little chance of owning a teddy. However recently mother brought me a stuffed panda from Toronto zoo. So my no name panda since his arrival is sitting in the study. His social skills are not great but he is quite a scholar, he sits on Grey's Anatomy surrounded by Walt Whitman, Freud and Rushdie..
Now that you have introduced us to Teddy and Edward I was thinking whom should I meet if I am given a choice to meet only one of them. I am sure I would like to meet Edward, the kind of gossip he has tucked in his heart we feel Teddy does not. What do you say? Is it a good choice? We are unaccountably somewhat sad that you never owned a teddy bear although we are certain that 'Eyore' was, and perhaps is, more than a satisfactory substitute. That you now have a panda sounds to us the greatest of fun, and an intellectual one at that really could not be bettered. Yes, in all truth, we really feel that Edward would be the bear for you and if you were to allow him a spin in your vintage motor car, then we feel that you would have a friend for life. Please don't be sad, I always preferred toy cars on anything else. You know a car crazy person I am. I would love to take Edward on a drive in yellow SL, that is what friends are for. Just need to know if Edward would like to come across the pond or should the car and driver come to Edward.. Yes, we can readily imagine you as a small boy with a collection of toy cars, each one very carefully looked after, something which would appeal to us greatly. Edward would be so excited to be out with you in the motor car. And if you and said car could come to Europe, what enormous fun we should all have. Such a shame you did not take Teddy with you to Rotterdam! We would have loved to meet him. We even have a spare bed, which will be just perfect for him. Have to get rid of the dust first though! I think my 'Teddy', who resides on my bedside table, would love to get acquainted to your Teddy as well. Maybe he can even show him around town, on your next visit..
Could you please pass our invitation to him? What fun that you already know of 'Cynthia' and her creator, Lester Gaba, who must, we imagine, have been the most extraordinary and highly individual man. Now, as a way to get doors opened......that is most definitely a thought!! Fear of flying, on Teddy's part [and Edward's too], prevented our bringing him with us to Rotterdam but now, having heard what a WONDERFUL time we spent with you all, he is determined not to be left at home next time. He will even be able to cope, we have warned him(!! ), with M's question, "How old are you?" So, yes, of course we shall pass on the invitation which, fear not, is already accepted!! As for meeting a Dutch bear, he will love that. Owwwwww sweet teddy's ..!...happy week you two...love Ria...x! And we too hope, Ria, that your week will be really happy and fun. Thank you so much for your comment. How handsome your two companions are! Their personalities are reflective of so many of us: some days we are quiet and contemplative, enjoying the comfort of our own home. Other days we are social, out and about enjoying the company of others. Such a thoughtful comment and, in your unerring way, so very right. And it is true of us all. There are times when one longs for the peace, quiet and even solitude of one's own surroundings, a necessary escape from the many trials and tribulations of the world. And then there are those other moments when one is alive to all the many experiences of life, happy to join with others in that great exciting whirl which is life itself. And in both of these we are so blessed. Oh! I have not thought of the Great Lester and Darling Cynthia in decades. At one time the better part of a semester was spent studying Gaba’s contribution to the field of visual merchandizing and special notes taken on how Cynthia and her sisters changed the look of store display forever. How saddening it is in this time of slow economies that all but the titans of retail have forsaken good visuals and released the departments of their staffs. As for the darlings Edward and Teddy, it is reassuring to hear they still maintain the code of silence that has held them in good stead by so many for so long. However, if Teddy is to continue to accompany you on outing about, you really must get him his own cell phone that he may text us all “selfies” from the marvelous locations visited. We totally agree about the effects of the economy on innovative window design. Where are the window dressers of old? A talented, creative group if ever there was one. Teddy with his own mobile telephone. What a brilliant idea. And with it he can join the great dysfunctional society who, or so it seems to us, largely make up today's world. Watch out for his first 'selfie'!! My son has a cashmere bear that has a label that says "Surface Clean only". That bear has survived hundreds of hot machine washes and tumble dries. This is a the Talent of the Bear. Cynthia looks a bit spooky but happy. Now a cashmere bear sounds very chic indeed. But we are less certain about the washing machine on his mental well being. In our day he would have been filled with sawdust - not a happy mix with water! We are, Karen, so very fortunate to have the Opera House but a short walk from our apartment here in Budapest and try, whenever possible, to take full advantage of it. The building itself is very spectacular and worth seeing in its own right. 'Cynthia' we found to be completely fascinating. How extraordinary that a mere mannequin should achieve such fame. There is indeed hope for Teddy!! We both wish you too a wonderful week. Your post made me smile! And the story of "Cynthia" is really fun! And how I wish Life magazine had never gone out of print. 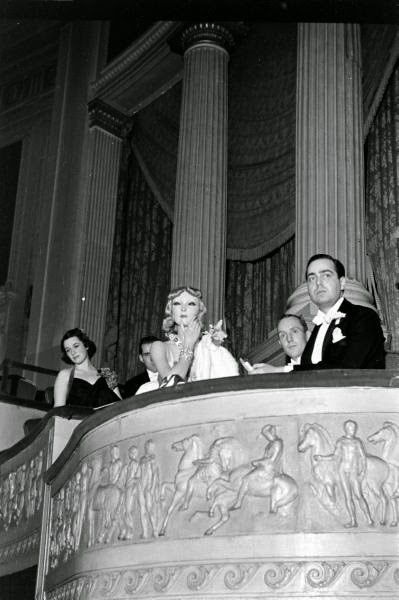 'Cynthia' really was a character and very much part of the New York social scene in the 1930s. What fun it all must have been. The slow demise of 'Life' magazine, with its constantly falling circulation figures, is sad to read. And nothing quite replaces it. What well traveled and well behaved bears! Loved seeing their adventures and the ideas they have put in my head about taking some of my animationally-challenged friends out and about! Thank you. Normally well behaved bears, but not always!! Certainly we should very much encourage you to take some of your 'animationally-challenged' friends on outings. It does add a certain interest to life and gives people something to think about! I love reading your blog! Your joy of life simple burbles in every post and I am always smiling when I start writing a comment. What a joy! Thank you for reminding us that teddies are far superior to texting! This is so kind and very generous of you. We do, in fact, look to you both to seize life with all that it has to offer and not to be afraid to venture into unknown territory. Your travels are an inspiration not only to us but others too. Edward, particularly, captures my imagination. I love his sweet contemplative soul! We too, Susan, have a very soft spot for Edward and we still hold out the hope that one day you will meet with him. But it is Teddy really who is the more musical!! What a clever segue from Edward and Teddy to the fascinating Cynthia. Unfortunately we did not make the acquaintance of either Edward or Teddy, which is as much excuse as will be needed to return to Budapest. You do not, Andrew, nor will you ever, have to find an excuse to come to Budapest again. The day spent with you, Ray, David and Ranjan will remain with us for all time. But next time it must be for longer. It’s so nice to hear of your two treasured bears. I’m afraid we have more than two! Only a select handful made it over to Lanzarote with us however, Most adorn the bookshelves, where they assist in my choice of reading mattter. I confess we have ‘favourites’: big Al and tiny Billy who sit together on our chest of drawers and pass judgement on our choice of outfit for the day. How wonderful that you should have an extended 'family' of bears and we do rather like the thought that they may, from time to time, delve into your bookshelves for a good read. Impossible not to have favourites. Big Al and tiny Billy sound great fun if not a little formidable when it comes to passing judgement! The State Opera House in Budapest looks very glamorous. I think we should be taking _all_ members of the family, from an early age! We were both introduced to opera when we were quite young and a love of it is something which has remained. We are so fortunate as to have the State Opera House within very close walking distance. Aren't Teddy and Edward such refined and handsome bears? Its marvellous that they are able to lead such a glamorous lifestyle, too, just like their owner. Yes, we rather think that both Edward and Teddy live somewhat charmed lives. But possibly not quite as glamorous as that which was enjoyed by 'Cynthia'!! The person to whom you once sold clothes does sound decidedly odd. But then there is, as we all know, no accounting for taste! LOVE Edward and Teddy …. very much like my own Teddy bear that I had as a child, who, I am ashamed to say, languishes in the loft at the moment !!!! We are so pleased, Jackie, that you like Edward and Teddy but are so very sad to think of your own bear languishing in the loft. Could he not be brought downstairs and given a new lease of life? We are delighted to think that you too have your bear, Stephanie. But now you have tempted us with tales of 'Muriel'. We are more than a little intrigued. How delightful, Matthew. Alas, both Edward and Teddy are probably rather too old for you. Now, if they were younger........!! Oh dear me, I get so caught up in reading the responses of your fascinating friends here that I often forget what I was going to say! What was it? Oh, as a rather shy person myself, I am quite fond of Edward. I am discreet too you know. But, if I may, also ask for more photos of Teddy if the occasion arises? This just delighted me to the tips of my toes. As always,Heather, you are so right and when it comes to the responses here which people have been kind enough to leave, we find ourselves overwhelmed by the creativity, imagination and sheer joy expressed by everyone. They are indeed 'friends' and we so value each and every one of them. And of course we are so very happy that you have enjoyed 'meeting' Edward and Teddy. They know of you well through the wonderful lavender bag which you once sent and which continues to give us such pleasure. I am an Edward who would like to be a Teddy and can only dream of being a Cynthia or a Hattatt. What fun you have! So inspiring. Much love to you. Your blog is lovely. The epitome of good taste mixed with just plain fun. This is more than generous of you. And what a delight it has been to discover 'Mrs. Winter Twig'. We long for more. Do, please, tell us how we may 'follow' you. Edward and Teddy are very sweet and they behave so nicely in these upscale establishments. I have read about Cynthia before and find it a bit strange but very interesting. She was a very glamourous companion. We too are not entirely sure what to make of 'Cynthia', Jennifer. Whatever, she certainly achieved a fame which many of today's 'celebrities' would be glad to emulate. That said, it does all remain very superficial and should, in our view, be seen as no more than that. Our equally imaginatively named Goldy Bear shares our home. He's been on many trips, and even wrote a Christmas story, complete with illustrative photos of ... himself. We are delighted to know that you have a Goldy Bear at home and one who, very clearly, is a talented author in his own right. May he perhaps feature on a blog post, or even write one, one day? Maybe! He has quite a high opinion of himself, and I'm afraid if we give him a post, he'll want a blog! Always the problem - give them an inch and they take a mile!! Oh, my Dears! What FUN and how familiar! Your spirit of fun is contagious, and so refreshing, especially in such staid, formal surroundings. And your Edward looks the consummate host, with an eye to guests’ comfort and an ear for sparkling conversation. A sage nod and an interested expression, and his reputation as a dining companion is secure---we ALL love a good listener---so much more congenial than Lord Snithers’ lumbago and .Mrs. Bufforphington’s pug’s asthma. And Teddy---what a charmer! Why, he must have every date on his dance card taken. Such a connoisseur of music and all the finer things, loving the programme, and admiring the art at table with a contemplative air, or is he contemplating a little seltzer down the pants of anyone approaching his own splendid Steiffian coat in such a manner. Your light-hearted sense of adventure, with such sweet, innocent small exploits in the proper settings, (and the knack of saving the de’il-may-care ones for the appropriate venues, in which they sparkle and delight, as well) is a great part of your charm and magnetic personalities. A mere trip to the market, for you two, seems to become a grand event, told in the most captivating way, and memorable for the doers, as well as the deed. I thank you for including me in your round of interests---I love dropping in for a feast of fun, and it’s always lovely to have a visit from you, as well. rachel, who wonders where on EARTH old tattered Opus got packed off to during the past decades’ several moves---now THERE was a penguin with tales to tell. PPS I have no idea where my comments go in this big world and wide, for they seem to disappear into some cosmo-electronic void at a faster pace than I can hit SEND. This is a second try at Teddy-Edward, so please ignore repetitions---that seems to be a habit lately. I must seem to have been absent from all my usual haunts, for nothing seems to go through, and I have visions of anything I might have said or asked over the past months, just floating there in the desert air, like my silly declarations and recitings and composings alone at home, washing dishes or folding laundry like some dotty Ophelia in a T-shirt. Do forgive my neglect---'tis not meant, but somehow missent by my clumsy fingers and fumbly brain. If you are not already a novelist, then you most certainly should be. For what avid readers we should be, hanging on the every word of Lord Snithers, sympathising wholeheartedly with the asthma of Mrs. Bufforphington's pug when their tedious, for it would be tedious, conversation becomes translated into the sparkling dialogue which you would create for each and every one of your characters. We are the ones who would be, and indeed are, charmed by your words. How splendid, we think, that you should have noticed the art on the table in the restaurant, Klassz. It was, and is, a little drawing done by our artist friend, Orr Máté, as a birthday gift, but not for Teddy who, we suspect, may have been a little disappointed not to have been the recipient. It is, as you surely know yourself, Rachel, the small exploits of life which give it both its fun and meaning and we really do delight in all the little happenings which occur day by day. In so doing, of course, we should all remember how very fortunate and privileged we are to live a life which is, mainly, free of hardship and social deprivation. There are those for whom this is not the case. Tales of Opus have, as you knew would be the case, immediately intrigued us. And if he is no longer in the land of the living but removed to that great icecap in the sky, then surely some of his stories are there still to be told?!! Now, do not disappoint us!! Comments left do disappear as they go for what is called 'Comment Moderation' which is a euphemism for a control to ensure that we are not being threatened and verbally abused. Then, once checked, we click on 'Publish' and they spin out of the ether to arrive here. As for the image of a dotty Ophelia in a T-shirt - we LOVE it!! No forgiveness is ever required. We know you are there and when are worlds connect as now, then what joy. But the love remains. Correction: for 'are' [final paragraph] read 'our'. You dear, sweet people. You know why we flock like lemmings every time your porch light comes on? Remember Halsman, who used to get even the most staid, tight-chinned royals to lighten up for their photos by asking them to jump? Well, you two JUMP. Just ain't near enough jumpers in this world any more. No, Rachel. It is you who is the kind, sweet person. All actually we wish for in life is kindness in others. Sadly, sometimes it seems in very short supply. You have it in abundance and it touches our world. Could we want for more? We think not. What fun to take Teddy out on the town! I am sure he will soon be recognised world wide, so maybe a paw stamp would relieve the ensuing tedium of having to sign all those prospective autographs? Well, Lynn, we can but live in hope. Meanwhile we ensure that Teddy's paws are sparkling clean for when that great moment comes and that he always washes behind his ears!! Teddy is the epitome of elegance and charm, even without a tuxedo, he is dressed to a 't', and would make the perfect guest at any formal dinner party or high tea! This is so very kind of you, Poppy, and flattery of the highest order. Both Edward and Teddy provide us with much amusement - harmless, we hope. And we wish you a really happy week. From my perspective, I believe Eddy and Teddy are just as glamorous as Cynthia, without needing the visits to the hairdresser, or the couture gowns, being, as it were, perfectly comfortable in their own skins. Cynthia, oh Cynthia, did her demise really mark the end of an era, a time, and place? We do somewhat agree with you that both bears are very much lower maintenance than ever 'Cynthia' was and are really quite content just to be themselves. Perhaps it is true to say that 'Cynthia' was a girl of her times, She most likely could never have survived in the modern world. Either that, or she could have become an even greater success - an internet star! May we be 'Groupies'? Even better, can we start the Official Fan Club? Such fun.......!! Now, Marianne, given the choice of a couple of vintage(!!) teddy bears and a labrador puppy, we know on which side we should come down. How simply adorable and an excellent, responsive companion which, sadly, we have to admit is rather more in truth than can be said for either Edward or Teddy!! I really enjoyed this post and photos! Thank you, Linda, for your kind comment. And now we shall go and seek you out! Darling Linda, as always you hit the nail right on the head. Edward and Teddy spend all their time naked and it is, as you say, just not good enough. Edward had a headdress once when a friend of ours who is a whizz with a scarf made him an impromptu one at a dinner party, but other than that......nothing. But, where does one obtain suitable clothing? We, of course, cannot run up anything, not even a handkerchief, so where does the aiming to be well dressed bear go these days? Bare Essentials? Thank you, we are very well indeed and we hope that it is the same for you. A chill is definitely in the air here but we are holding on to the last rays of summer as long as we can. My dear Hattat's, I feel a little research is needed here, as there is a definite chill in the air and we have naked bears, it's just not right! So glad you are both well and holding on to the last days of summer. We are decidedly autumnal here, but I don't mind, I love this time of year. Darling Linda, we are touched by your concern for our naked bears, especially now the days are chillier. We shall, as is our usual research technique, look into the blogs of our fellow bloggers to see if there is any help to be had. We know that Frances can run up a scarf that other bears would be fighting over and we can be confident that Vix and Curtise would be able to give both our bears the retro look that is suited to their age. Perhaps you, Linda, could concentrate on tracking down a wonderfully romantic look for Cynthia...or, rather, Cynthia's replacement. And, then, who knows, if Cynthia strikes lucky, you, darling Linda can be commissioned to do the wedding flowers! Maybe buy Teddy a top hat? I will keep my eyes on the mags you mentioned...I feel sure he will ,,,or should be featured. He has quite the social life! A top hat would be perfect for Teddy for his Opera outings, Janey, what a brilliant suggestion! Would there then be three Mad Hatters, we ask ourselves? I am very much looking forward to meeting Edward and Teddy. I won't tell my own bears about them, though. Like Edward, they are homebodies (except for the one who keeps me company at work), but I fear they would be very envious to hear of Teddy's glamorous lifestyle. And, meet them you will, Alexa. They are both very excited about your visit and Teddy cannot wait for his next Opera outing. What fun it is all going to be. How wonderful that one of your bears keeps you company at work. The corporate environment can be so stressful these days, we are sure that a teddy bear or two at the office would be a brilliant way of making the workplace more people friendly! Dear Jane and Lance, this delightful post introducing us to Edward and Teddy does seem to have conjured up a very amusing teddybear's picnic. So many bears and their companions seem to be gathering here together. It's definitely a place of fun. My very own Ted, who's been a part of my life for most of my life sends his own very best wishes to all gathered here. The music, refreshments, conversation and atmosphere are marvelous. Oh, Frances, you are so right. It is all taking on a rather jolly atmosphere, teddy bears do that, don't they? The world needs more teddy bears and picnics, we must have a grand one in Central Park together one day! We agree with you about Cynthia. She does have a rather standoffish air to her. Certainly, more at home in The Met box rather than sitting on a rug on the grass. Still, with you and your darling Ted and the four of us, no other company would be needed. We have a portable, wind-up gramophone and there is always plenty of fizz in the fridge. If you could make up a sandwich or two.....our bears are light eaters.......then it would be perfect. Now, which way is it to your house? I love the story of Cynthia. Lester Gaba was obviously a very clever man. It was just the right time for such a caper. In the meantime, Eddy mans the home-front, perhaps listening to a little music, or taking a snooze or two. We are so very sorry that your original comment simply disappeared and how kind of you to write a second time. We know only too well how frustrating it is when this happens. Yes, Lester Gaba must have been a highly inventive person and one in possession of a great deal of self-confidence to have carried off so much of what he did with 'Cynthia'. Teddy does, or so we assume, enjoy his outings. Whatever, it amuses us and, hopefully, is no more than harmless fun. We think that with them both there is quite a lot of snooze time!! Hello there Jane and Lance. A delightful piece from you both. I'm sure that Teddy has more between his ears than many of the mobile bipeds towering over him. And yet he remains undaunted in his zest for life. Did his path ever cross with Cynthia's, I wonder? Darling Faisal, what an intriguing thought, a clandestine meeting between Teddy and Cynthia! This has set our minds wondering what exactly our two bears may be up to after lights out in the dining room. And, is a new C21version of Cynthia ( out of the same mould, of course) allowed in under cloak of darkness....animal antics and mannequin madness! There are times, I'm sure for all of us, when we feel like a mannequin or a toy in the crowd around us, watching things happening, but being unable to effect any impact. There must be some exchange of ideas between your two bears, when lights are out. Teddy must hanker for a bit of quiet. Edward must long, fleetingly, to step out. It's the third party, Cynthia, who may very well bring about some kind of serendipitous solution. I can see myself in Cynthia, longing to speak. It is just possible, Faisal, that in the dead of the night the mute 'Cynthia' forgets her laryngitis and becomes a veritable chatterbox, even to the extent of keeping Edward and Teddy awake. We do rather agree about the times we feel like a toy, often in a very crowded and uncomfortable toy cupboard. Such is today's world. What a simply adorable post. I love Teddy- so wonderful that he enjoys his outings with you. I do believe that more of us should be doing this.. rather than being with people who are texting and with their mobile phones all the time ..ever so unsociable.! Teddy I am sure was very indignant.. a little hello, would not have gone amiss. I had never read or heard of Gaba and Cynthia. How he must have had the diners and others intrigued at it all. Most enjoyable reading. Please give my kind regards to Teddy. Teddy is thrilled at all the attention he is receiving. Indeed, we are concerned less all this talk of front page magazine appearances and celebrity status goes straight to his sawdust filled head! We are delighted that you are also in the same camp as we are over the wretched all pervading mobile telephone. The art of conversation really does seem to be dead these days but, when one suggests talking to a brown furry stuffed animal in stead people do tend to look at us rather strangely! Now, why should this be, we ask ourselves?! We are so pleased that you enjoyed hearing about Cynthia. We think that Lester could have been a great friend but we have to confess that, from all the pictures we have seen of Cynthia, she does not appear to be the jolly sort! Thank you, Massimo, we are delighted that you enjoyed the post. Now, if Teddy needs a press photographer.......may we call upon your services?! First let me thank you for your kind comment about my 10th wedding anniversary. It is always nice to hear from you. Second, Edward and Teddy are at once adorable and sophisticated. How wonderful to have two companions to accompany you on your cultural outings and to entertain at home. I can imagine the looks and the conversation that they invoke. My husband and I are quite fond of our 14 year old dachshund and miss her terribly when we travel, so a friend gave us a small stuffed one to accompany us on our journeys. As of today, this little "Munchen" has had many adventures, to include mass at Notre Dame, drinks at the Ritz, walks along the Seine, box seats to hear Andrea Bochelli, as well as many other. Each time we pull her out of our bag and set her in her spot, we get a few strange looks but for the most part people point, then smile. As for Lester Gaba, what an interesting man. Self-confidence like that is a rare thing. Have a wonderful weekend and thank you again for your visit! We found your anniversary post enchanting, Elizabeth. It was such a tender tribute to your husband and to the obviously wonderful years you have spent together. As you said, it is a rare and beautiful thing to find someone with whom one wishes to spend every moment, but that you have and we were touched by the affection and respect that you clearly both hold for each other. May you enjoy many more years together! And, how we adore your tales of Munchen. What a very lucky dog she is. We have kept the visit to the Ritz and the Andrea Bochelli concert information from Teddy as we do not want him to sulk. As we are sure you appreciate, these stuffed animals can take on a huff and not then talk for days on end! But, you have placed another thought in our heads.......mass in the Basilica in Budapest.....now, we are certain that Teddy would love it. All the bells and smells and a friend of ours is a priest there. We are laughing to ourselves at the idea of Teddy kneeling at the altar! As to what our friend's face may look like .....well....we just hope that he is not reading this! We agree completely about Gaba's self confidence and do so admire it. The world, we feel, is becoming far too uniform. Vive la difference! I don't recall ever having a teddy bear and it appears that now I must get one, I didn't realize that I was missing out on so much fun! 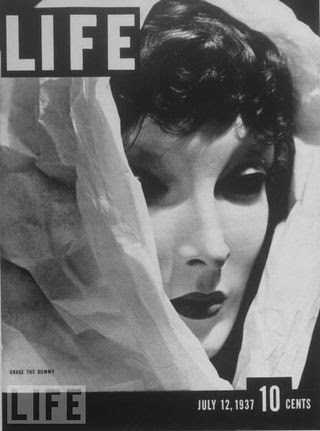 I love the story of Cynthia, what an interesting person Lester Gaba must have been, and to make the cover of Life...that must have been quite an accomplishment. People here put mannequins in the passenger seat of their cars so they can use the commuter lane on the freeway, but that doesn't sound nearly as much fun. We are amazed, Adrienne, that you have never owned a teddy bear. And, yes, you must rectify this as soon as possible for we are sure that you would love such a jolly, furry companion and, most definitely, there could not be a more welcoming home than yours! What an intriguing wheeze it is to put a mannequin in the passenger seat in order to use a different traffic lane. Are you sure that they are mannequins and not just exceedingly bored commuters.....it may be hard to tell the difference! That is a fascinating bit of history about 'Cynthia' and Lester Gaba. Please post more photos of Edward and Teddy's adventures!! We did find the whole story of Lester Gaba and Cynthia remarkable and felt that they were indeed a product of those wonderfully carefree and stylish times. Will there be a return of such personalities, we wonder? Perhaps people these days are rather too sophisticated for this type of jolly ridiculousness. Still, we are comforted that there are blog readers here who seem game for all this fun! Clearly I need to dine out with a Teddy and not a person, as he won't be trawling through the social media as I attempt to make conversation. And I'm sure the Teddy experience will be a refreshing change from the usual predictable human goings-on. I just hope he doesn't get so famous we'll both be hounded non-stop by the paparazzi, on the lookout for embarrassing Teddy misdemeanours. Cynthia is stunningly beautiful. Any chance of a date in the near future? Well, we really do share the view, Nick, that in so many instances when one looks across a restaurant to see so many dysfunctional people a teddy bear might, indeed, prove to be more satisfactory company. Alas, 'Cynthia' is spoken for, in more ways than one!! Jane! This was such a delightful read! And welcome, thank you and I am happy that you came by to visit me! First of all, I am enchanted by TEDDY and EDWARD. They are great companions. My husband and I too have several "friends" that bring us much joy as we engage in "conversation" and create fodder for storytelling! Your sweet bears look like beautiful heirlooms that were passed down? Absolutely sweet are they! And this Cynthia! I had never heard of her, but what an interesting chap to take her to restaurants! I adore a mind that thinks from different angles and knows how to have fun. Wishing you and Lance well and much happiness as we all enter into a new season! It's been a lovely summer. I hope you have some traveling in your plans? We are both so very delighted that you have enjoyed the post, Anita, which really came about on account of the discovery of 'Cynthia' and the highly individual Lester Gaba. Both Edward and Teddy have been part of our lives for more years than we care to remember. As an exceptional storyteller yourself, you will readily appreciate how such 'props' can be employed to weave or expand a tale. We do hope that you have really enjoyed the summer and that you still have much to which you can look forward. We shall go to England for a week or so in September and then, after that, we have house guests to which we are much looking forward and then, at the year's end, we fly once more to South America. We both send love and good wishes. Love your sweet little Edward and Teddy and your post made me smile. How lucky Teddy is to enjoy the opera and outings with you. Carolyn, we are of course so pleased that the post caused you some amusement and how kind of you to say. Lester Gaba and 'Cynthia' were something of a 'discovery' for us. We think that he must have been a very unusual person, highly creative, imaginative and not a little difficult. We send love to you and best wishes for a really happy and restful weekend. What wonderful, well-behaved bears, and I confess that I have a very old Steif named Teddy, of course, who was my small companion for many years. He now resides in a safe place with a glass window to watch the comings and goings. Pookie was my long-time companion through most of my adult life, but he retired to a quiet spot in the house to contemplate art, fine crafts, and music. Little petite "Bunny" has traveled through Europe and South America, and even posed in front of an ice flow in Patagonia! But Oskar, the knitted creation of a dear friend regularly travels with me now and has already confided that he will be so very anxious to meet the Hattatt bears. He is well-behaved and quite cultured, having been to France six or seven times. Until I read all of the comments from your readers, I have been very reluctant to talk of my little travel friends. Apparently, we are all in good company! I am beyond excitement to meet you all, and can hardly contain myself. How often we find ourselves continuing to try something or other with the computer, becoming frustrated at its failure to 'work' only to find that we are either ignoring an instruction or simply doing the wrong thing! Now, Genie, we are a tiny bit envious that you should have the Rolls Royce of all bears, a Steif. Now that is something, and we are delighted to know that he is happy in retirement watching the world through the window. Could 'Pookie', by any chance, be related to that Pookie, the rabbit with wings, who was a character in the books of our childhood written by one Ivy Wallace? Or perhaps that is simply coincidence? Whatever, 'Bunny' sounds to be exceedingly well travelled [not too much of that must be revealed to Teddy] and already we are all curious to meet' Oskar'. He will, be warned, find Hungary very different from France, and whilst Budapest is often referred to as the Paris of the East, well ......you will see for yourself. How lovely to meet Teddy and Edward and hear all about the adventures of Cynthia and her companion. This post has made me smile. Teddy looks perfectly at home at the Opera and seems to enjoy great comforts at the restaurant. We have never understood why people can't put their phones down for just a few hours and enjoy human company and their surroundings. It amazes us to see families on the beach, walking with their children, or even their dogs whilst on their phones. Teddy certainly does enjoy, or so we assume, his outings. Madness? Perhaps!! We too, as you, are astonished at the way people today do not seem able to be parted from their mobile telephones for any time at all. We often wonder as to whom they are talking and what about as these 'conversations' appear to be endless. Most tiresome of all is when they take place, for instance as on the bus, and one cannot escape them and is subjected to every word, often at full volume. Teddy and Edward are obviously charming. Our daughter, Jessica, travelled always with JR bear. When he preferred a nap in the car rather than going into a restaurant, we always brought him a treat. Usually a packet of jam, but sometime – wonder of wonders – there would be packets of HONEY! Jessica (now aged 30) just sent me a picture of JR and her cat Cheddar sharing a pillow and a cuddle. We love the idea of Jessica's bear, JR, being treated in his youth to little surprise gifts of jam and HONEY and are delighted to know that he is, even as we write this, alive and well and enjoying the company of a new friend, Cheddar. Thank you so much for the comments left on previous posts to which we have made reply. So sweet. :-) I don't have an Edward or a Teddy or even a smartphone, but I do have a much-loved rabbit who sits on the rocking-chair in my bedroom. It really is no loss to be without a smartphone, Perpetua, but we are most happy that you do have a 'much-loved rabbit'. Is he, we wonder, Welsh, Scottish or French?!! I adore both teddy bears, Edward and Teddy. I want to take them home with me. I believe they must be the most cultured and sophisticated bears in the teddy-bears' land. I have got my teddy bears at home, philistines in comparison to Edward and Teddy as they never seem to be able to elevate to the standard of going to opera or ballet. My beloved teddy bear called Tennyson had a ball when I took him out to "Papa Growlers Teddy Bear Picnic" at a national trust property, eating pies (not from Fortnum & Mason, I should add) and grease leaking down onto his chin. I do not think Teddy and Edward would approve of Tennyson's diet! I wonder what Cynthia would order for her drink. I hope you both are having a lovely weekend. We are certain, dear ASD, that both Edward and Teddy would love to go home with you especially to meet with Tennyson who sounds great fun but who just might perhaps lead them astray, with the best of intentions of course! The 'Teddy Bear Picnic' at a National Trust property sounds to have been most entertaining and how splendid that you went along with Tennyson. We should certainly have approved of that for Edward and Teddy. We both send love and greetings for the week ahead from a very wet, but warm, Budapest. How wonderful. I do like your teddy bears. I have five Harrod teddy bears all boys except for Scarborough Barbara 2000 I'm not at all struck on her, she's dressed in an oriental costume and I'm not a big fan of mandarin collars, she has small gimlet eye and has a mouth like a wasps arse, she sits sulkily on top of the laundry basket, not really the standard practiced by Debretts but there you go. I have one called Edward too, though I like to pronounce mine as Edouard with a silent d at the end, he's not a Harrod's teddy bear he came from a antique shop in Castleford called Past Times. How extraordinary and how wonderful to have five teddy bears and all of such very good provenance!! We really do prefer the boys ourselves although we have to say that 'Scarborough Barbara 2000' does sound to be deliciously common and should, we feel, be loved for that and the waspish remarks which doubtless she makes from atop the laundry basket. Of course, as you will have known, we adore the fact that your Edward', name is pronounced in a wonderfully foreign sounding, Marlene Dietrich(ish) way. We imagine that he is a little superior, coming as he does from Castleford which sounds hugely grand. Edward and Teddy are quite the charmers and Cynthia's beauty shines forth from her. In the balcony photo she looked like an actual person. 'Cynthia' must indeed have been the most extraordinary 'person', but then we rather think that of Lester Gaba himself. But such a wonderfully wild imagination. I'm afraid I can't remember having a teddy as a child but was quite attached to a 'golliwog' I'm nut sure if this term is now politically correct but that is what he was. I also remember collecting (the 'g' word) from the jars of Robertsons jam. What quaint fun we had in those days! We too remember 'golliwogs', a term and soft toy about which we have not thought for years until now. Most likely they are no longer to be had as, we assume, those paper ones on Robertson's jam which, collected up, could be exchanged for a metal brooch!! All very harmless and innocent fun. I, for one, should love Teddy's paw print. Is it wrong of me, however, to be utterly spooked by Gaba's shattered companion? And you shall be the first to have one!! Not at all. In some lights 'Cynthia' and the more extreme of Lester Gaba's ideas can be viewed as extremely weird. Nice to meet you, Edward and Teddy! I immensely enjoyed this post. Jane and Lance’s story-telling is fantastic. I’m more interested in the contemplative philosopher, Edward, what ideas and thoughts are in your mind. You two must have spiced up Jane and Lance’s life with your different personality. You will not be shattered into pieces when falling from chair, but take care not to be drenched in the rain or from slipping into water. Take care and enjoy your life. We are so pleased that you have enjoyed this post, Yoko, which was always intended as a little bit of fun and not to be taken too seriously. Happily neither Edward nor Teddy is likely to be shattered. The worst fate that can befall them is, perhaps, the loss of an eye, attack by moth or some sawdust escaping. But we shall not tell them of this!! We are rather saddened to learn that you have never had a teddy bear of your own but it does rather sound as though you most likely have to act as an adoptive mother for the bears of your children! We are most alarmed to hear news of the Teddy Hospital and do trust that all will be well. We are certain that you would be able to charm Edward into telling all his secrets - not so good for us!! Me again....I am returned! Dear Jane and Lance, I loved reading about your Bears and am reminded of Aloysius, Sebastian's Teddy bear from 'Brideshead Revisited'. According to Wikipedia, he was drawn from Sir John Betjeman's Teddy who was called Archibald Orsmby-Gore, Evelyn Waugh was friends with Sir John at University. I seem to remember reading about Lester Gaba somewhere. She looks beautiful, must have behaved impeccably and obviously never kept him waiting whilst she re-did her make-up. The mannequins of today look really similar to Cynthia so I hope he patented his design. I love how utterly outrageous you both are, I wish I could grab on to your tailcoats!! I resolve from now on to resurrect my mad-cap days! How lovely to hear from you, Jane. Indeed, Aloysius remains a firm favourite with us but we rather keep quiet about him to Teddy and Edward as neither moves in quite such illustrious circles and we never indulge them with quails' eggs [which actually we rather enjoy ourselves]. Lester Gaba was, to all intents and purposes, a somewhat strange figure but one to be admired for the sheer inventiveness of creating and popularising 'Cynthia'. We must all to a degree live madly for to do so makes life so much more interesting!! I wanted to let you know that I finally found the follow button for my blog. I hope when you have time, you can stop by and visit. How excellent! We are now your second 'Follower' and should, as a result, have all your posts coming into our 'dashboard'. We shall very much hope to welcome you here too as one of ours. We much look forward to keeping in touch. Teddy, of course, has instantly warmed to the idea of giving you his autograph and, we suspect, is thinking of you as an enormously fun playmate. You are so very kind, and far too generous, with your comments. In response we can only say that they are always a delight to read, often hugely amusing [as the one left on Bath Time] and much appreciated. After all, why should you so kindly indulge us in this way? But a heartfelt thank you for so doing. So pleased to know you are teddy bear fans. My husband and I adore them too. I used to have a very old bear, Timmy, who used to go everywhere with me but limbs kept dropping off so he stays at home now. My son seems to have carried on this love of teddies as he is now deciding which bear to take to university. Ridiculous as it may appear, we derive huge enjoyment from both Edward and Teddy and when taken on 'outings' they certainly add interest and at times create something of a stir!! We are delighted to know, Trish, that you and your husband share an enthusiasm for bears. Timmy sound wonderful although we are saddened to learn that his days of going out and about may be over. As for your son taking a bear to university - ADORABLE!! You are fellow arctophiles! I went so far as to marry a man called Ted. Thankfully he was enchanted by the fact that I was rarely without a small bear called Hereford about my person, usually in my pocket with just his head sticking out. Poor Hereford never made it to an opera house however which I now see was very remiss of me, but he is enjoying a retirement spent mostly sleeping on my dressing table. How really splendid, Annie, that you should marry someone named Ted and that you too also have a favourite bear, Hereford, a name which we find most appealing. Perhaps, occasionally, he can be brought out of retirement to accompany you on some of your outings?!! Thank you so much for providing the link; we were unaware of it! This is one of my favorite posts...although Cynthia does creep me out a bit...hee..
We are, of course, delighted, Irina. How really lovely of you. WE shall certainly give both Edward and Teddy a hug from you! too cute! Hi Jane and Lance...love your sense of humor and joie de vie! I knew of Cynthia from fashion history photos. Her mysterious countenance is not easily forgotten but I never knew her background. Was Gaba of Hungarian origin? It's nice to see you do come through with the eccentric in your subtitle. I'l be looking for the esoteric next!